KB Energy, LLC specializes in tilt-up tower services, including meteorological tower installations, decommissions, refits, and repairs. Ours is a wind resource assessment company that helps those who want to harness the energy of this renewable resource. The met towers we install provide essential information, from wind speed to direction, temperature, barometric pressure, and relative humidity. Count on us to be there at the very beginning of your project. We also offer the manufacturing of remote power supply units for LIDAR and the design and manufacturing of the K-BAT Bioacoustic rigging for tilt-up met towers of up to 80 meters. Our service area is primarily the Western United States; however, we do expand our area based on our customers’ needs. We work with wind energy developers in gathering the data to assess the feasibility of a wind farm in the area. These include private companies, landowners, and government agencies. The data helps developers make plans for the best uses of the land, regarding the placement of turbines, to enable the farm to generate as much energy as possible. You demand safety in all aspects of your projects. 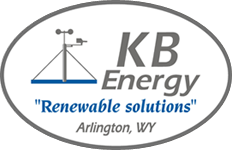 KB Energy, LLC is a preferred installer of many wind resource assessment companies and respected professionals in the wind industry. Safety is important to us, and with more than 2,500 towers under our belts, we have an exceptional safety record. Our company prides itself on a well-earned reputation for quality workmanship and personal service. We are continually improving our wind resource assessment services to meet the needs of our clients. During our time in business, we have installed or assisted with the installation of more than 1,500 meteorological towers. That’s a lot of towers for developers who make use of the wind as energy. Contact us today to discuss the installation of your met tower. Headquartered in Rock River, Wyoming, we serve clients across the country.